On the Front Lines in the Battle Against Invasive Species: Strike Teams! Invasive Species Strike Teams are an important part of environmental stewardship; they are the protectors and defenders of our native plants and wildlife! Invasive plants are fast spreading and can create ecological changes that crowd out native plants and alter habitats to make them unsuitable for native insects or animals. The goal of the strike teams is to manually remove these plants in areas of significance to protect our native biological diversity. A diverse landscape is healthier and more robust, better able to fend off threats and adapt smoothly to changes, such as climate change. 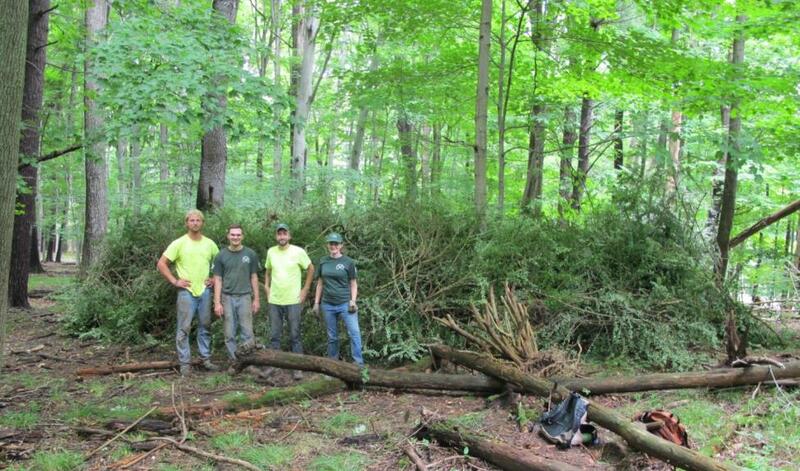 Above: Our 2014 Western Strike Team in Letchworth State Park, showing off all their hard work removing Japanese Barberry (Berberis thunbergii). Japanese barberry is a commonly planted ornamental which escapes into forest understories and increases incidence of Lyme disease. What is a Strike Team anyway? The New York State Parks Invasive Species Strike Teams consist of seasonal employees who travel throughout New York State to remove invasive plants from the most valuable areas of our Parks. These teams of four camp near their project areas to accomplish the goals of the Invasive Species Program. All these removals are done with manual hand tools, such as pick mattocks, shovels, machetes and loppers. Our strike teams are always up for the physical challenge and have made incredible headway against some large opponents. 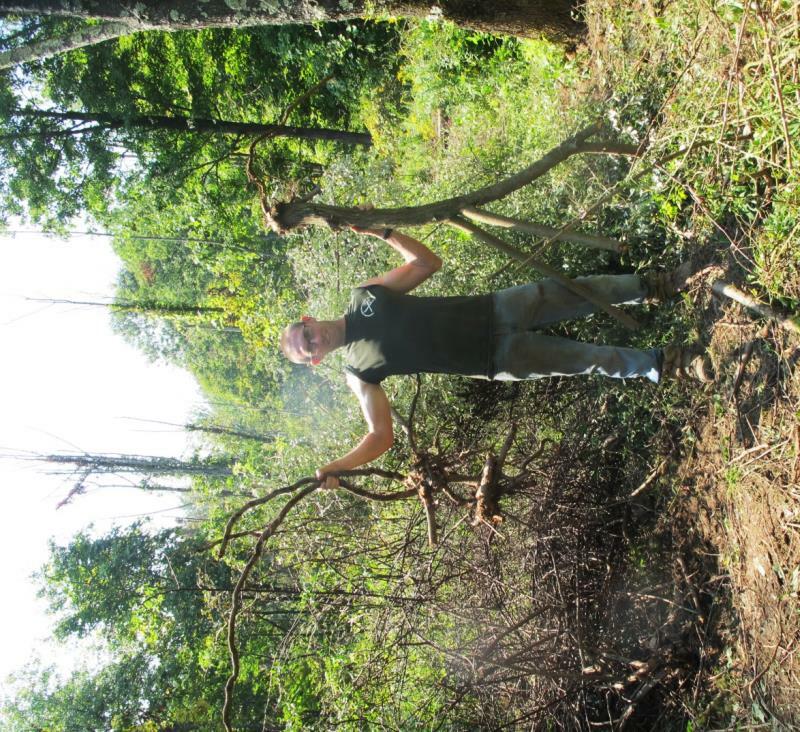 Above: A strike team member from 2012 who proudly showcases the large autumn olive (Elaeagnus umbellata) he removed with hand tools, determination and brute strength. Machinery is used to remove large shrubs, but our strike team got there first in this case! Invasive Species Program staff has had many successes in controlling invasive species by carefully selecting projects geared toward terrestrial invasives, which can be controlled manually and through adaptive management. 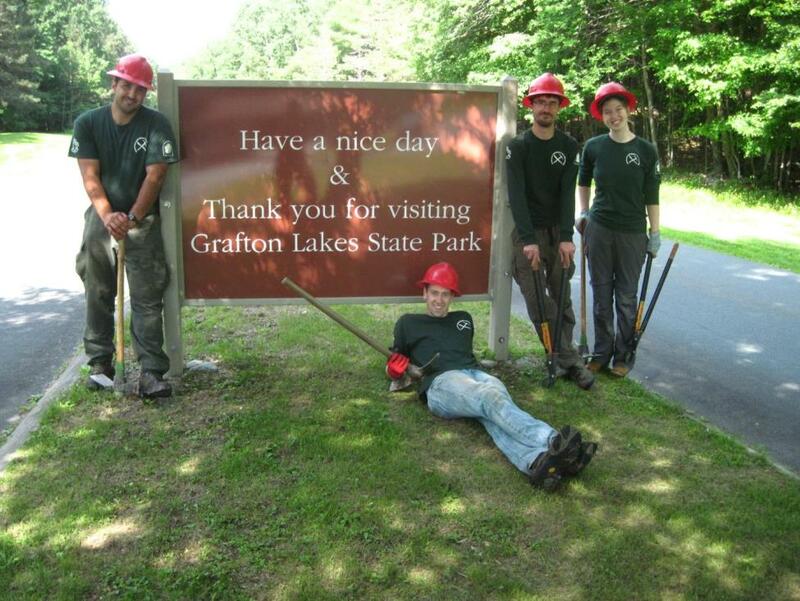 Above: The 2015 Eastern Strike Team wishing everyone well from Grafton Lakes State Park, outside of Albany. You can see some of our most often used tools in this photo (From L-R: the ax mattock, pick mattock and loppers), as you can see, other essential elements in their toolbox include the hard hat and gloves! Starting in 2008, six interns and volunteers assisted with invasive species removals state wide. Since 2010, State Parks has employed 46 seasonal staff to remove invasive species. In the past 5 years over 1100 new observation points were entered into the program iMap Invasives, a national database reflecting new sightings of invasives. On average, strike teams remove 19 different species per year at their project sites. Some of the native species which are protected by the invasive species program include: twinleaf, American Hart’s tongue fern, sky blue aster, cardinal flower, Chittenango ovate amber snail, the Karner blue butterfly, several warbler species, mountain mint, bushy cinquefoil, and slender blazing star. Above: Two examples of native plants which benefit from strike team controls. On the left, the spring flowering twin leaf (Jeffersonia diphylla). On the right, the stunning late summer red of the cardinal flower (Lobelia cardinalis), a plant loved by pollinators. For more information regarding Invasive Species Awareness Week (July 12-18) events, check out the New York Invasive Species Information Blog. Post by Alyssa Reid, Minnewaska State Park Preserve (OPRHP). Photos courtesy of OPRHP.